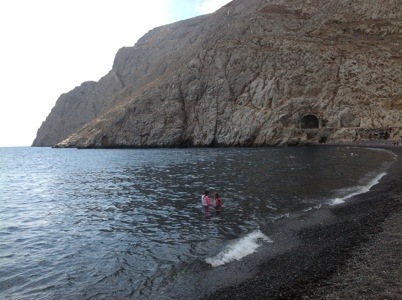 I am currently sitting at Kamari beach, Santorini, watching the kids pop up out of the water occasionally and yell excitedly to each other about the new kind of fish, the size of the fish, the number of fish, or the really cool seaweed directly below them. 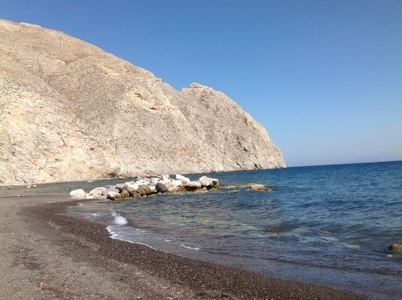 They have been enthralled by these beaches, from Monterrosso in Italy where the snorkeling craze began, to each of the beaches we have visited in Santorini. Now, I have always said we are completely spoiled on PEI, and we are. We have the most amazing sandy beaches. But this is different. We have been avoiding the sandy replicas of PEI beaches, and heading to those that are more unfamiliar and interesting for the kids. The black sand of Perissa where the ocean floor is just a big volcanic slab, the charcoal gray pebbles of Kamari, and the creamy pumice cliffs of Vlyxada have all been favourites, each one surprisingly as good as the last (even though they only ever want to go to the last one they went to!). There is a very famous red beach here as well, and we did go check it out, all the while thinking “what’s the big deal, we have tons of red beaches”. 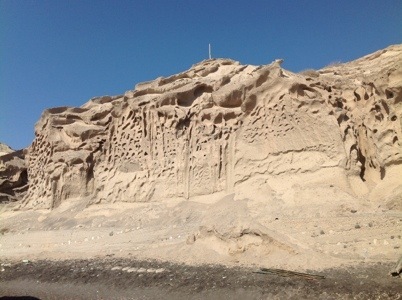 And although we didn’t venture down the cliff to get to the actual beach, it was interesting to see. 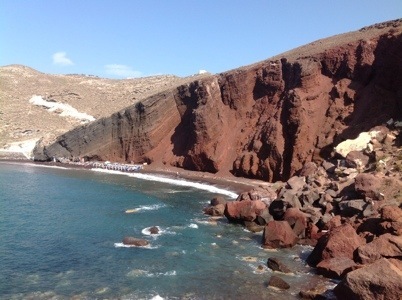 Not like ours at all really except in colour – massive red volcanic cliffs, and red porous rock almost like pumice, but the wrong colour. Not sandstone. It has been such a pleasure to see the kids exploring these new ocean playgrounds and listening to their tales of exotic creatures! We even do “beach math” with pebbles!